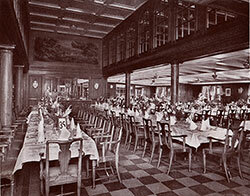 Discover the beauty in our collection of vintage menus, organized by cruise line. 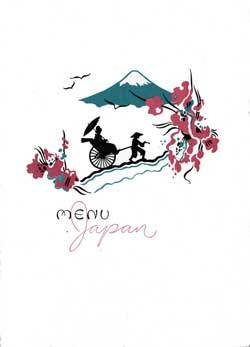 Superb graphics, old autographs, and delectable menu items can be found browsing through this section. 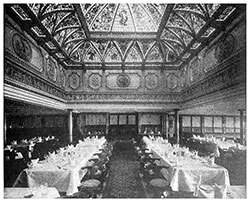 According to Mr. Scholz, the menu furnished passengers [in 1912] does not vary in many particulars from that provided on the Gellert. 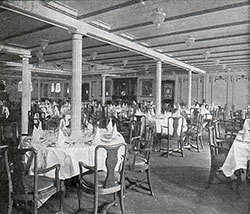 But the improvement in refrigeration is such that food is preserved much better, and, as a natural result of this improvement, many perishable delicacies, such as shellfish, fresh fruits, asparagus, and berries, which were then served only the first two or three days after the steamer left shore, are now served every day to the end of the voyage. The Aberdeen Line was founded in 1824, and long occupied a prominent place in the Australian trade with its fleet of fast-sailing clippers. The present fleet, however, consists entirely of steamers, and of these, the Themistocles and Demosthenes, of 12,000 tons, are the most famous, Besides cargo, first- and third-class passengers are carried. Allan Line Vintage Menus available at the Gjenvick-Gjønvik Archives. Voyages of the American Line, a Steamship Company of the International Mercantile Marine Company, covered the transatlantic routes between the ports of Southampton and New York, Liverpool and Philadelphia and calling on Cherbourg, Queenstown (Cobh) and sometimes Plymouth. American Mail Line, established in 1920 by the United States Lines, was a steamship line that ran between Seattle, Washington, and the Far East. Ownership of the American Mail Line was transferred to the newly formed American President Lines in 1938. As a Division of the United States Lines, American Merchant Lines operated transatlantic services between the ports of New York, Plymouth, and London. 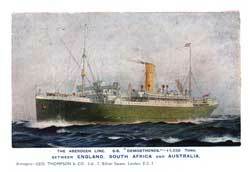 In 1916 the Donaldson Line merged with the Anchor Line (partially owned by Cunard) to form the Anchor-Donaldson Line. The new joint venture between the Anchor Line and the Donaldson Line utilised ex-Donaldson vessels to serve the Canadian route. 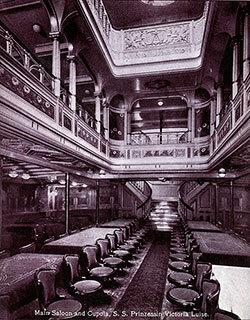 The transatlantic voyages of the Anchor Line typically operated beween Glasgow, Scotland and New York with stops in Moville, Liverpool, Queenstown (Cobh), and Halifax N.S. The Atlantic Transport Line operated transatlantic passenger service primarily between New York and London from 1881 to 1936. 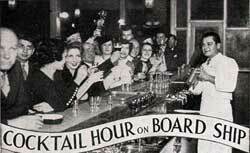 It was an American owned company that was operated by the British and sailed under the British flag. 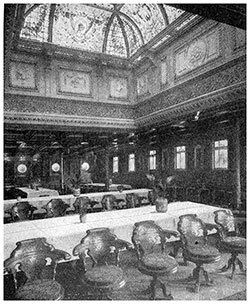 The Canadian Pacific Ocean Services Steamship Line offered First Class (via their Empress Ocean Liners) and Cabin Service between Montreal and Quebec Canada and Southampton - Liverpool; Glasgow - Belfast; Cherbourg - Antwerp; and, Queenstown - Hamburg. During the winter, departures are from Saint John NB. The rule was always enforced to sacrifice speed to safety, and never to run any avoidable risk. 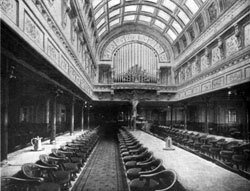 Even now, though newspapers often speak of "racing" and "making a record," it is believed that the Cunard ships are never allowed to practice either. 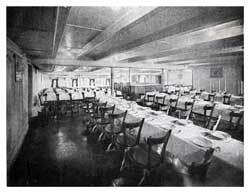 The Cunard White Star Line (1934-1949) was formed as a merger of the two once giant steamship lines - The Cunard Steam Ship Company and the White Star Line. The French Line (Compagnie Générale Transatlantique) had regular sailings between New York, Plymouth (England), and Le Havre. 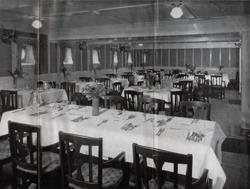 Their steamships included the SS Paris, SS France, SS Normandie, SS Lafayette, SS Rochambeau, SS Chicago, and others. 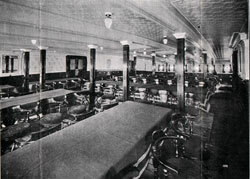 The Furness-Burmuda Line operated a fleet of steamships that operated primarily between New York and the Bermuda Islands. 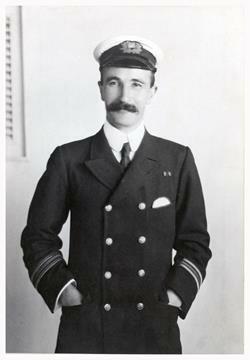 The company opened its New York — Bermuda service in 1919, taking over a passenger operation that had been started by Furness Wilthy. 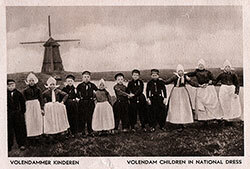 Holland-America Line, a Steamship Company of the Netherlands that covered the transatlantic routes between the ports of Rotterdam and New York, and occasionally calling on the ports of Boulogne-sur-Mer, Plymouth, Southampton, Boston and Halifax. Norddeutscher Lloyd Bremen (North German Lloyd) runs many lines from its headquarters at Bremen; among them are those to New York - a line of express steamers and a line of ordinary mail steamers, all calling at Southampton or Cherbourg. Vintage Menus of the Den Norske Amerikalinje / Norwegian-America Line (NAL) Available at the Gjenvick-Gjønvik Archives. 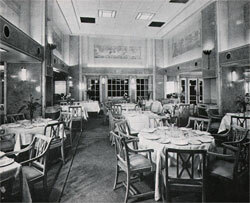 The transatlantic voyages between Oslo and New York were made with the following Ocean Liners: Kristianiafjord, Bergensfjord, Oslofjord and Stavangerfjord during the period covered by the Gjenvick-Gjønvik Archives. The Royal Mail Steam Packet Company provided transatlantic passenger services to and from Hamburg, Cherbourg, Southampton and New York, and on occasion, Quebec. Royal Mail Lines Ltd (RML) was created in 1932 and took over the ships of Royal Mail Steam Packet Company and other companies of the former group. 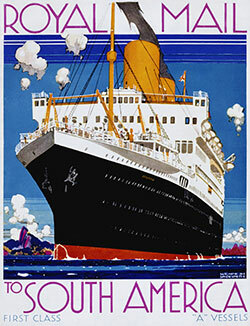 The new company's operations were concentrated on the west coast of South America, the West Indies and Caribbean, and the Pacific coast of North America; the Southampton – Lisbon – Brazil – Uruguay – Argentina route was operated from 1850 to 1980. 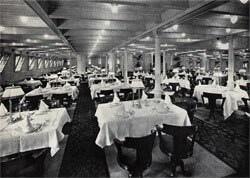 RML was also a leading cruise ship operator. Koninklijke Nederlandsche Stoomboot Maatschappij, Amsterdam (KNSM ) was a long established Dutch shipping company and one of the really great Caribbean, Central American and South American traders with a very big fleet. 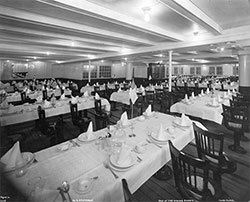 The popular steamers of the the Scandinavian-American Line sail the broad Atlantic than the splendid modern twin-screw steamers which maintain a regular direct service between New York and Scandinavian ports. 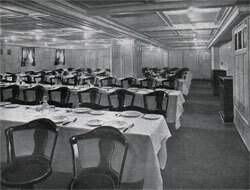 The Swedish American Line began transatlantic service in 1915, and offered passenger, freight, and mail service direct between New York and Gothenburg, Sweden. 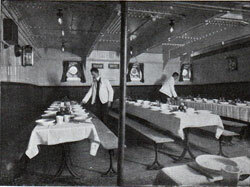 They provided excellent passenger accommodations carrying first, second, and third-class passengers with exceptional cuisine. The Union-Castle Line offered a number of passenger and freight services including Royal Mail Service; Intermediate Steamship Class Service, East African Coast Service, Mauritius Service and Service to Lobito. For the UK, They served the ports of London and Southampton. The United American Lines has its principal steamers, the Resolute, Reliance, and Cleveland, under the Panama Flag. The first two, which have been in operation more than a year, are firmly established in the trade. United States Lines operated cargo services from 1921 to 1989, and ocean liners until 1969—most famously, the SS United States and the Leviathan. 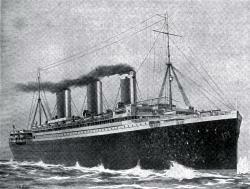 USL was the only US Government owned Steamship Line. From time in time the Line has presented Father Neptune with lusty and lustier twins. The first pair were the Britannic and Germanic; then came the Majestic and Teutonic, then the Cedric and Celtic, then the Adriatic and Baltic and finally the leviathans Titanic and Olympic. 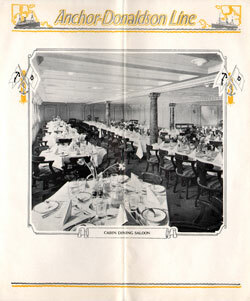 Vintage Menus from the GG Archives collection are representative of the menus, typically printed on board each steamship during the voyage onto a blank pre-printed graphic cover. The bill of fares was intended as souvenirs of the journey and provided to each passenger for that class (First, Second, Third, Tourist, etc.). 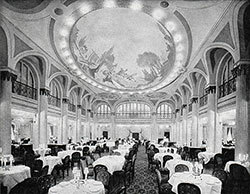 Many survive today as delightful displays of gourmet meals served in elegant dining saloons on the ocean liners of yesteryear.